Project management isn’t just about projects — it’s about people, too, which is why it’s important to get involved with PMI. Break away from your project and reap the personal and professional rewards that come when you get involved. 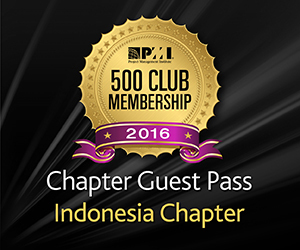 So please join PMI Indonesia Chapter events, or volunteer your time at a PMI Indonesia event, and increase your opportunities for leadership, collaboration and networking.